NPR had this article up on its All Tech Considered site recently. For those who don’t feel like clicking, it deals with e-readers, and their ability to track how people read. Now, setting aside the slightly creepy feeling that comes over me whenever I realize that almost every new thing I buy is going to monitor everything I do and perhaps critique it (is there a word for that? spydenfreude? ), this is all sorts of interesting. It means that soon, places like Amazon might be trying to convince authors to pay for data mining the people who bought their books. How many stopped after the first chapter? The first page? How many re-read it? How many got part way in and then deleted it? How many immediately finished and bought the sequel? I wonder, for things like the I-pad, can they use the accelerometer to track how many chucked the device at a wall while reading a work? This is the kind of thing that can make living in the future insane. Look, I can see the usefulness. If everyone is skipping past my detailed, totally-necessary-for-the-plot description of my main characters spice rack, then maybe it’s not so necessary. But I can’t help but worry that this is one more thing to add to the vast pile of if you only do this, you’re writing will totally sell, sell, sell! Data is good. Feedback is good. Knowing what works is good. But this kind of thing makes me worry that we will all drown in a sea of data points, desperately swimming towards the perfect while the good floats slowly away. So, one of those short story sales I talked about a few months ago? 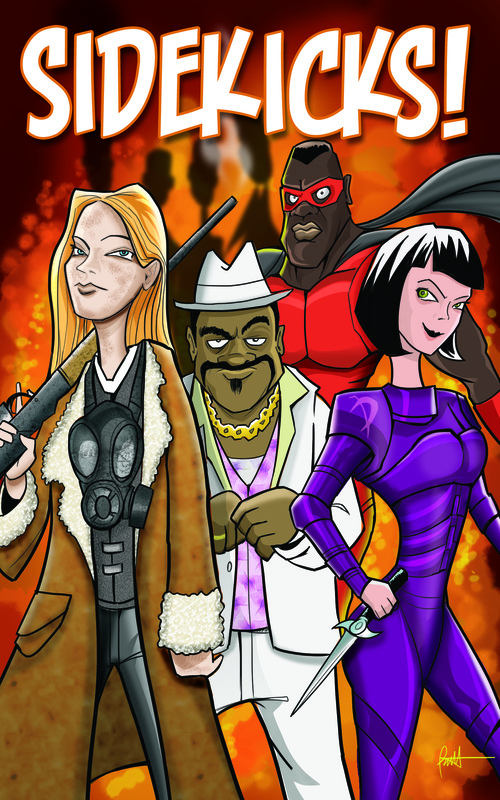 My story “At Your Service” will appear in the Sidekicks! anthology, edited by Sarah Han. The most important people don’t always get top billing, ya know, and this antho is full of stories about them. This was one of those stories where I had a vague concept of what I wanted to write about but no real ideas for how to do it until I’d written half the story. That’s when the light bulb hit–a ha!–and the rest just flowed. A few editing passes later and I had a final draft. I’m a “pantser” by nature; for me, going in blind is half the fun. Remind me of that in a few months when I’m moaning about how much I hate writing first drafts. After being sick for a week, and then gone for a weekend, and then having to unexpectedly un-hack my website, I’ve spent this week just trying to get back into a routine. I keep hearing that it takes 30 days to set a habit. But some habits seem to take 6 months. And undoing them? That takes 3 days. So instead of saying, ok, I’m going to swim twice a week and read and meditate every night and either do art or journal every night and I’ll write every evening and weekend mornings and I’ll do this at lunch and that after dinner…I just have to get in the habit of looking at the schedule and doing what it says. Since my brain isn’t actually all that smart, it thinks “follow the schedule” is one thing. Since I’m not a drill sergeant, I do cut myself some slack. (Thus, the past two weeks of sick/recovery/website mess.) I’ll skip my morning exercise if I know I need to sleep. Things come up at work or in life. I am not “supposed” to be writing this blog post on my lunch hour. But I love that I’ve tricked myself into setting a bunch of habits all at once, and I love seeing the giant empty white blanks of weekend afternoons, and I love knowing that yes, I do actually have time to do all these different things and have lots of writing time, I just have to stick to the schedule. Well, it’s that time of year again. Time for W-2’s, 1040’s, and tears. But it’s okay. There are still story ideas brewing in the back of my head, it’s just a little more crowded in there than usual, what with all the numbers crowding for attention. Numbers and words. It’s an odd mix in my head sometimes. Unfortunately, it also means that I’ll have to take a blogging hiatus for the next month or so, at least until the busiest part of the season is over. Don’t worry, you won’t be rid of me completely. I’ll pop in every now and then when I can, and when the season is over, I’ll be the one planning the party. Or I might be sleeping for a month. That’ll be good too. I’m going to dodge Jaleigh’s question for right now. I have an answer for it, but I’m feeling a bit distracted. You see, I’ve been stabbed. Okay, that’s a bit dramatic. I found out recently that the cute little bump that had popped suddenly into existence under my arm was an abscess. A little infection that gets treated with a sharp blade and fire. The fire in this case being an antibiotic. Not a big deal, but a bit distracting. Now lets see if I can relate this bit of medical TMI to writing. I spent most of the procedure (when I wasn’t gritting my teeth) asking the doc about how this sort of things happens, what would happen if it went untreated, and how people deal with this sort of thing when they don’t have scalpels and antibiotics (not nearly as well). Curiosity, and distraction, yes, but this is also a key thing for writing. Taking everything that happens to you, and imagining it happening to different people under vastly different circumstances. To tell stories, you have to somehow empathize, to relate to people going through situations you will never experience. Everything like this that happens to you gets thought about, played with, exaggerated, blown up, used. If a little thing like this hurts that much a few hours later, lets think about what my knight whose been stabbed with a dirk is going to be feeling once the adrenalin wears off. If they have to be so careful about wound care because of the chance of infection, what’s going to happen to my post-apocalypse survivor who just got all road-rashed when the mutants threw her off that train? It’s a little silly, trying to relate something so small to big things like that, but what the hell else do I have? I can talk to others about their experiences (and boy, writers can be creepy about that…what was the sound, when the teeth went in? ), but nothing is as clear, as immediate, as what happens to you personally. That’s why they say write what you know. What they don’t say is that you’ll often need to exaggerate the hell out of what you know. For me time-travel stories are mostly wish-fulfillment. Who doesn’t want to go back and change a decision, see a deceased loved one one last time, or say an apology? Everyone has regrets, and time travel is one way for fiction to fix them. And while we don’t like to think about it, we all have a finite life span. Wouldn’t it be great to see what life is like long after we’ve died? What will the world be like one hundred years from now? Time-travel stories let us explore that. So, yes, they can be a bear to write, especially in the long form. You’ve decisions to make in terms of which theory of time you’re going to use in your book–multiple universes? One timeline? etc.–and then plotting issues that revolve around that decision. You have to think about how your characters impact not only their current timeline but others. And, oh yeah, you have potential paradoxes to think about. It’d be helpful to have a Physics consultant on hand *cough* Elizabeth *cough*. At the core, though, time travel stories are like any other story. They’re about a person who wants something and you’re not going to let them have it right away. Time travel is just another tool in your character’s arsenal. And when you think about it like that, it’s not so daunting. Right? Right!? Yesterday, Jaleigh asked if there were stories we’ve sworn to never write. Time travel is not on my stories-to-avoid list. I’ve played with it for a couple projects and it’s too much fun, even though trying to keep everything straight makes my head hurt. That’s part of the fun. That means no First Girl stories for me. No girls becoming the first girl to do something boys have been doing for centuries. No tall, strong heroines running away from home disguised as boys to join the army. No brilliant female students struggling to be allowed to learn secrets reserved for males. No women stuck with menial jobs and spells dreaming of the glory and power they could have if they were men. And no flipping that and writing a matriarchy instead of a patriarchy, either. I still screw this up. I tend to default to male characters when I need a generic sorcerer, college administrator, royal advisor. I often come up with a new character and then ask myself, is there a reason this person has to be male? No? *waves magic wand* She is now female.